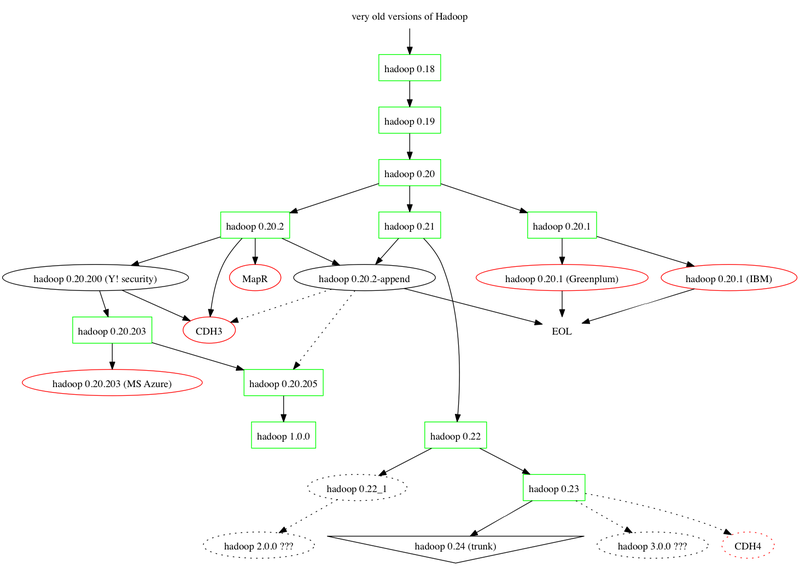 In the good tradition of helping people to understand the intricacies of Hadoop ecosystem and what versions are coming from where I am updating the popular Hadoop genealogy chart. Enjoy! 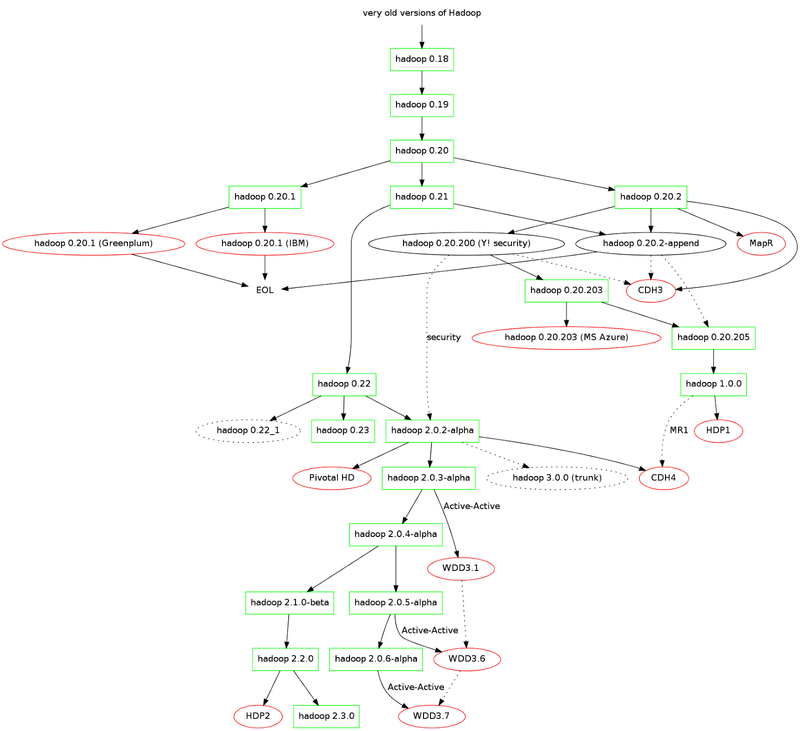 The release manager of Hadoop 0.22 and my namesake Konstantin pointed out that my diagram has alignment problems. So, I have posted a latest version to the same post. Enjoy. 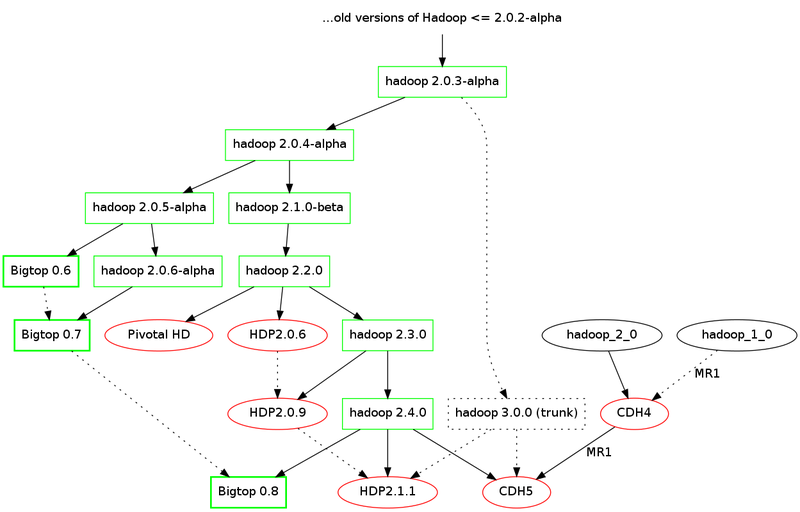 What you wanted to know about Hadoop, but were too afraid to ask: genealogy of elephants. Hadoop is taking central stage in the discussions about processing of the large amount of unstructured data. With raising the popularity of the system I found that people are really puzzled with all the multiplicity of Hadoop versions; the small, yet annoying differences introduced by different vendors; the frustration when vendors are trying to lock up their customers using readily available open source data analytic components on top of Hadoop, and on and on. So, after explaining who was born from whom for the 3rd time – and I tell you, drawing neat pictures on a napkin in a coffee shop isn’t my favorite activity – I put together this little diagram below. Click on it to inspect it in greater details. A warning: the diagram only includes more or less significant releases of Hadoop and Hadoop-derived systems available today. I don’t want to waste any time on some obscure releases or branches which never been accepted at any significant level. The only exception is 0.21 which was a natural continuation of 0.20 and predecessor of recently released 0.22. Red ovals are for commercial Hadoop derivatives which might be based on Hadoop or use Hadoop as a part of custom systems (like in case of MapR). These derivatives can be or can be not compatible with Hadoop and Hadoop data processing stack. Once you’re presented with the view like this it is getting clear that there are two centers of the gravity in today’s universe of elephants: 0.20.2 based releases and derivatives; and 0.22 based branches, future releases, and derivatives. Also, it becomes quite clear which are likely to be sucked into a black hole. The transition from 0.20+ to 0.2[1,2] was real critical because of introduced true HDFS append, fault injection, and code injection for system testing. And the fact that 0.21 hasn’t been released for a long time, creating an empty space in the high demand environment. Even after it did come out, it didn’t get any traction in the community. Meanwhile, HDFS append was very critical for HBase to move forward, so 0.20.2-append has been created to support the effort. A quite similar story had happened to 0.22: two different release managers was trying to get it out: first gave up, but the second has actually succeeded in pulling an effort of a part of the community towards it. As you can see, HDFS append wasn’t available in an official Apache Hadoop release for some time (except for 0.21 with the earlier disclaimer). Eventually it has been merged into 0.20.205 (recently dubbed as Hadoop 1.0) and that allows HBase to be nicely integrated with the official Apache Hadoop without any custom patching process. The release of 0.20.203 was quite significant because it provided a heavily tested Hadoop security, developed by Yahoo! Hadoop development team (known as HortonWorks nowadays). Bits and pieces of 0.20.203 – even before the official release – were absorbed by at least one commercial vendor to add corporate grade Kerberos security to their derivatives of Hadoop (as in case of Cloudera CDH3). unavailability of Hbase due to the lack of HDFS append in their systems (EMC, IBM). In case of MapR you end up using a custom HBase distributed by MapR. I don’t want to make any speculation of the latter in this article. Apparently, the vacuum of significant releases between 0.20 and 0.22 appeared to be a major urge for Hadoop PMC and now – just days after release of 1.0 – 0.22 got out. With 0.23 already going through release process, championed by HortonWorks team. That release brings in some interesting innovations like Federations and MapReduce 2.0. If you can imagine the variety of the other animals such as Pig, and Hive piling on top of Hadoop, you would get astonished by the complexity of inter-component relations and, more importantly, about intricacies of building a stable data processing stack. This is why another Apache project BigTop has been so important and popular ever since it sprung to life last year. Here you can read about Bigtop here or here. Author DrCosPosted on January 15, 2012 January 17, 2017 Categories apache hadoop versions5 Comments on What you wanted to know about Hadoop, but were too afraid to ask: genealogy of elephants. DrC0s Create a free website or blog at WordPress.com.